Greetings from the tip of Cape Cod, MA. Jeff and I are vacationing in Provincetown (Ptown for short) for most of his summer break (he is a teacher and his summer comes to an abrupt end on August 13th when teacher workdays begin). This is the site of the first landing of the Pilgrims. They decided the sandy soil was not great for farming, spent their first winter here and sent out expeditions to find a better location for their settlement. This took them to Plymouth, which claims to be the site of the Pilgrim’s landing, although fails to mention it was their seconding landing. Even though we are on vacation, I’m still waking up around 6am. This is good because it gives me time to do things like Tuesday Stretch while it is still tranquil and quiet here. Cape Cod is home to several very early glass companies and art glass is still made here. None of the New England-based glass companies made stretch glass but we still find a piece now and then when we are out antiquing. Some of the art glass made currently is iridized and is very beautiful, but it is not stretch glass. Tonight I’m going to share some stretch glass vases. This isn’t going to be a comprehensive examination of stretch glass vases but rather simply an opportunity for you to see some examples of various sizes, shapes and colors. We have an abundance of vases in stretch glass made during both the early period and the late period of production. 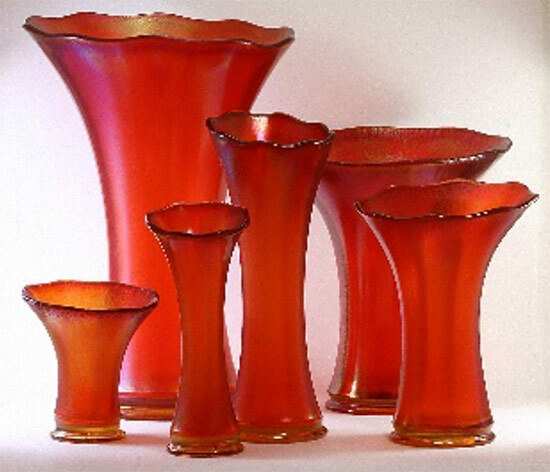 The range of colors is equally broad and many of the vases are more easily found in the market today than are some of the other stretch glass items. With consistent focus it is possible to put together a very nice collection of stretch glass vases. I can attest, from personal experience, that stretch glass vases are well-suited for floral arrangements, although some shapes may be a bit more challenging than others when it comes to keeping the flowers and greenery in place. Let’s look at a few of these stretch glass vases and see if you can imagine where they might fit in your home or in your collection. These vases were made by (from left to right): US Glass, Fenton, Diamond, Lancaster, Fenton, Northwood, Fenton, Fenton and Imperial and are all from the early period. All of these vases are known in more than the color shown, so if you like the shape but not the color, you may be able to find it in a different color. These were made by US Glass, Fenton, US Glass, Vineland, Northwood, Imperial and Fenton (late period). Again, most of these vases can be found in other colors except for the Late period Fenton one. 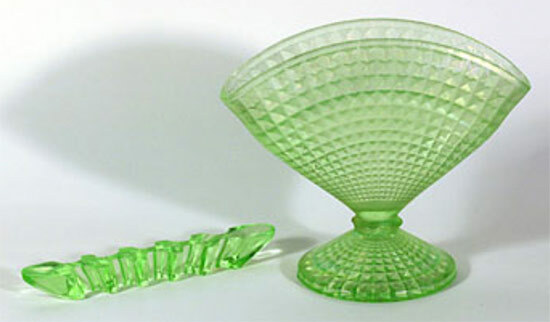 Late period stretch glass items were not typically produced in multiple colors. There are a few pieces which were repeated over the years as the colors changed, but very few. This is a significant difference from the production in the early period when items were frequently available in multiple colors. No look at vases would be complete without including the Fenton fan vases. These were made in both the early and late periods. I find these vases to be challenging to use for live floral displays unless I use the fan vase flower frogs (only available for early period fan vases, and not very available at all). Fan vase are available in 3 sizes plus a very small Celeste Blue one (5th from the left) is known which was made from a cologne. It is a OOAK, so far. The Ruby twin dolphin vase was made as a convention souvenir for The Stretch Glass Society and was popular with members. Today they are found for sale on line and in auctions from time to time. As you can see, some of these vases were decorated, some were made with special plungers and all are colorful. Whether you are going to put flowers in them or not, they look wonderful just sitting on a mantel, table or shelf. There is one known in Persian Pearl which is slightly larger and has a rectangular knob aka a handle in the middle on the top. These frogs fit perfectly in the fan vases and make flower arranging much easier. Apparently not too many of them were made or lots of them were broken because they are scarce today. Next week is The Annual Stretch Glass Society Convention & Show in Marietta, OH. One of our seminars will feature Robert Henkel, a retired professional florist, demonstrating how to arrange flowers in stretch glass vases. The theme of our convention is “Stretch Glass Should Be More Than Just A Collection” and our member displays will show how we are “Rethinking (how to use and enjoy) stretch glass in the 21st Century.” We invite all of you to join us. It isn’t too late to register (visit www.stretchglasssociety.org and register on line) or just show up on Wednesday, July 25th, and register at the door. We have a full schedule of events through Friday evening when Tom and Debra Burns present another spectacular auction of stretch and other glass. The auction is open to all.